Today's post-qualifying press conference with Lewis Hamilton, Sebastian Vettel and Valtteri Bottas. Lewis Hamilton: That was a tough qualifying session. Obviously the weather was going up and down and we didn't really know what to expect. Obviously Ferrari are incredibly quick this weekend a lot of work went on in the background with my engineers to make sure we got the car to be best place we could. I'm just really happy to be here in Brazil, you know, knowing I've got Senna's design on the back of my helmet, so I mean... I didn't know I had the pole, the last lap wasn't that great, if I'm honest, I had a bit of understeer in a few places but I was so grateful when I heard I got pole. LH: I just appreciate so much the love that I get here. It's been a crazy journey with the Brazilian fans. Obviously the first year I came here I was fighting against Felipe and I was almost the enemy when I left but over the years it's really grown to I think adore each other. There's a huge amount of respect I have for them and I love the country so it works hand in hand. LH: I don't know, we'll see. You've seen how quick the Ferrari's are. I mean, they had a lot more blistering yesterday than we did on the supersoft tyre. I don't know if it's correct but we wanted to be on the soft and things kind of swung us the wrong way. Right or wrong we will see tomorrow but hopefully still, with the choice we have, I'll make the best of it. Q: Enjoy tonight, at least you've got that four-metre head start tomorrow. Sebastian, coming very close there - P2. A different tyre strategy as we just discussed with Lewis. Are you happy with today? Sebastian Vettel: Yeah, I think it was good fun. In the end I had a tiny lock-up in Turn 8. I got a good start to the second attempt in Q3 and I thought I'd go for it, but it was a little bit too much, so I lost some time and didn't improve. It was very close, so it was a fun session. Q: I don't know if you are aware but you have been called to the stewards for the scale incident. What do you have to say about that? SV: I think it's better if I don't say anything... They shouldn't call us, because when the conditions are changing like that I think it's unfair if somebody gets called in and yeah, I wanted them to hurry up. Q: How difficult is it for a driver and an engineer to read the conditions when it's coming like that. Is it more the driver's feel or do you have to stick to the weather systems on the computer? SV: It's a difficult one. Inside the garage we don't really see much, you can't see out. You have to trust the laps you did before. You have to trust the communication you are having with the pit wall on the conditions, what you see other cars are doing. But when it's like this it can be anything, so I think in the end we all got lucky that we got more or less the same conditions for everyone, so as long as that's the case then it's fine. Q: Well, I hope you put on a good show like you did in Mexico, show that fighting spirit. Valtteri, third today, not far away, but I guess you can't be happy with that? Valtteri Bottas: Yeah, not far away but here the margins are small. I knew this weekend I did have the pace to be on pole. I think it was there for me to grab but I couldn't take it today. I was more than two tenths up in the second run but lost everything in the last corner on the back straight without any tow, so it was quite disappointing. VB: Yeah, it really depends on the situation but once the rain really started to come down luckily we already had a good lap on the board, so there was no need to take risks. But sometimes you need to go for it and try. LH: Well, the track was actually really good. There's a lot of grip here and it's a fantastic circuit. They don't generally make circuits like this anymore. You've got the different... it's quite hilly, but it's a real challenge, even though it's quite short. It's very technical - but the grip felt quite good and obviously, the rain was popping in every now and then - but it was just spitting. It was difficult to really tell whether it was going to be slippery in the next corner or not - because when you're travelling at the speeds we go at, on your visor, because you're driving through all the rain, it looks like it's raining more than it is. So, that was definitely tricky - but I think everyone did quite a good job with it - and luckily it held off so we could push at the end when the track was good. Q: You mentioned the speeds you're doing here at Interlagos. Valtteri's pole position last year was a new track record - you have taken more than a second off that time. Just how quick does it feel around here now? LH: With the new tyres, with the soft tyres, supersoft tyres and the updates that we have to our car... it's a smaller circuit, shorter circuit, so therefore the difference usually... for example our car is a lot quicker than it was last year at this point - but it doesn't show as much. At other circuits it's three seconds-plus. Around here a second is still quite a lot. So, it does feel great though, around here. Into Six and Seven it's a little lift through there basically and flat though... there's no other corners where you're flat out, or anything like that but you definitely do feel... the grip is what you feel, it's just amazing. It's better than ever. SV: Pretty good. I think it was fun. I think the track was good, as Lewis said, and obviously very close. I had a good start to my final attempt but yeah, tried a little bit too hard probably, going into Turn Eight in the middle sector and locked the front and then lost a little bit the rhythm. Tried something special in the last corner, didn't work so... yeah. All in all pretty happy. I think we got the car where it is happiest, and the balance was good in qualifying throughout, so we'll see. We'll start with a different tyre tomorrow. Maybe that can make a difference. Q: Just to elaborate on that point about the tyres, do you think that'll be the crucial point in the race? SV: Hmmm... might be. I mean, I think it's the tyre that probably most of us probably wanted to start on but then with the conditions it was a bit tricky. Yeah, in the end it wasn't really wet but there was some rain around the track, so yeah, happy that we got it done and now we start with a different tyre, so let's see. Q: Valtteri, fastest in Q2, you're less than a tenth off pole position but starting third tomorrow. Just sum-up the session for us. VB: I think the gap is a bit more than one-tenth but obviously, it's a bit disappointing one red car got in-between us and the pace I had this weekend so far felt like I could definitely fight for the pole position, and I think it was there for me to grab it. But in the second run I was more than two-tenths up on my best lap but somehow Turn 12, just lost a little bit and then I think I was the first car out in the last run so I had no tow on the back straight and just kept losing time on the uphill. 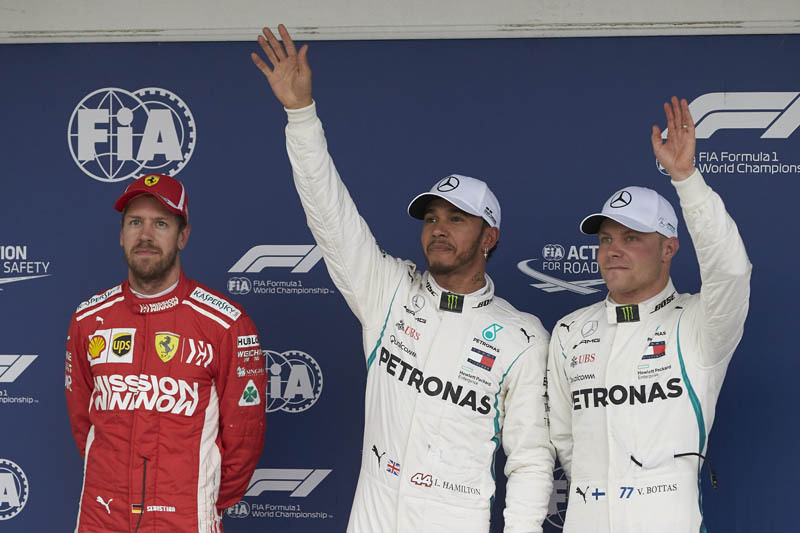 And I saw that it was not going to be an improvement, so for sure that's disappointing but yeah, it was a strong qualifying for us as a team and another great pole for Lewis - but yeah, I think for tomorrow, we'll see how our decision to go with the supersoft is going to... what's going to happen. Q: (Scott Mitchell - Autosport) Seb, could you just talk through the weighbridge incident please, just from your perspective - and are you now worried about getting a grid penalty for tomorrow's race? SV: No, I don't want to talk through. I think it's pretty clear what happened, so. I think we do qualifying, we should talk about qualifying. Q: (Christian Menath - Motorsport-Magazin.com) Lewis, there was a situation between you and Sergey in Q2, I think. Can you talk us through that situation? It looked pretty scary from outside. LH: Yeah, basically everyone was on an 'out' lap - me, Sergey and everyone in front of me - and when you're on your 'out' lap, towards the end of the lap Valtteri was up ahead of me so he was backing off to get his gap so I had to make sure I kept a gap with him. As far as I was aware, no one behind was on a lap so I was making sure I had the gap but then all of a sudden, out of the last corner - sorry, out of turn 11 - I saw a car coming at high speed so I was like 'oh my God, is that someone on a lap?' so I went to move to the left and that's where he decided to go but he wasn't on a lap, so I don't really know what his thinking was really, with it, because respectfully, between all the drivers, we all do respect... you know, I could have easily tried to overtake Valtteri or Valtteri whoever was in front of him. We all know to keep our space by that point so it was generally quite a disrespectful move in the sense of where it was dangerous between us both because I was not expecting it to happen that way, and so I was actually trying to get out of his way but he ended up going inside but then he got to the corner and then slowed up to utilise the gap but then also I don't know whether to slow my lap up or not. It was kind of strange. It was completely unnecessary because we had a space behind, behind him there was a bit of a space so ultimately his lap and my lap weren't great from that so hopefully he can learn from it.